AC-Tek realized the industry’s need for a new, easy to use, conveyor design program filled with the latest in technology and current industry standards. The Sidewinder software is AC-Tek’s response to this need. It represents a new standard in easy to use conveyor design software and engineering technology. Below is a summary of many of the Sidewinder features. If you have any questions, or would like more information please contact us. Sidewinder was developed from the ground up using the latest software development tools and years of conveyor design experience. The program’s features interface and entire hierarchical structure was thoroughly laid out before development began. This resulted in a very flexible software package that can easily be upgraded with new features and technology in the future. The program can handle conveyors of any geometry, length, and drive configuration. Numerous advanced features have also been included such as; vertical and horizontal curve analysis, turnover and transition stress and requirements, quick geometry input, auto sizing and calculations of major components, terrain modeling, dynamic analysis, and much more. From day one, Sidewinder was design to be easy to use, with easy to understand input and output data. Whether you’re designing a small in-plant conveyor, or a long overland system, sidewinder can handle them all. Sidewinder engineers have designed a simple data input layout unlike anything currently available. A single universal input screen was designed to provide easy access to all relevant input data. Additionally, a single tabbed data output window allows quick access to all relevant output data with problem areas highlighted showing potential problem areas. Conveyors are found around the globe. From small in-plant conveyors to the large overland systems, and in all regions of the world. The ability for the software to perform calculations in both standard and SI units was an obvious must. Additionally, users can quickly switch units for all input and output data with a single mouse click. As there are several different calculation methodologies used worldwide, we have chosen to include all which we feel are the most relevant. Both the universally accepted DIN and CEMA standards are available. Other published methodologies are also available (Jonkers, Spans, etc). 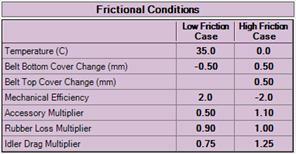 These methods use the specific belting rubber viscoelastic properties and other factors. The software has been designed to support multiple languages for non-English speaking countries and areas. 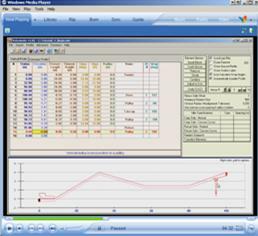 All inputs, outputs, and full word reports are available in many languages. The users can also switch between languages at any time by simply pressing the F12 key! Furthermore, if we don’t currently support your language we can send you an Excel spreadsheet in which you can fill in with your specific language. We will then implement this directly into the software free of charge! High quality professional output files were at the top of the list when determining the most important engineering features to include in Sidewinder. A custom report editor is built into the software, as well as the ability to export reports directly to Microsoft Word documents and Adobe PDF files. Company logos and other custom information can be specified in the software. Pulleys, brakes, and other major equipment lists are generated which can be directly supplied for manufactures for quotations. 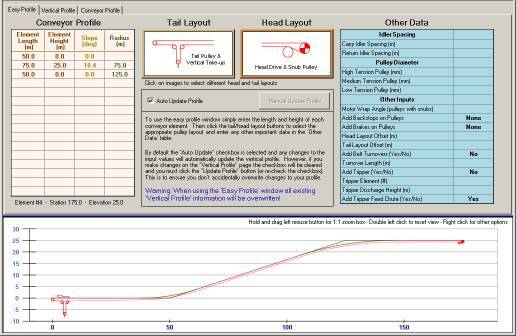 Easy Profile – Allows a basic conveyor profile to be entered using only a few conveyor elements. 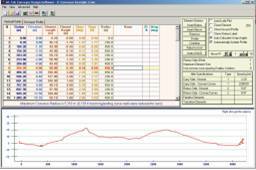 All basic information is entered on a single screen and can easily be modified later. Dozens of standard conveyor configurations are available in order to minimize the input requirements for the end user. This is appropriate for most small conveyors (<1000 ft.) which have relatively simple profiles. 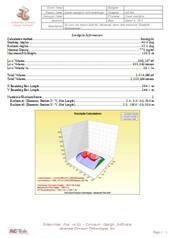 Standard Profile – Allows an unlimited number of vertical and horizontal curves to be entered. 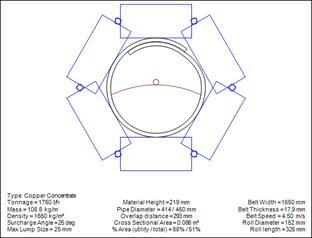 This information can be directly entered, or imported from several standard drawing packages such as AutoCAD. Each conveyor flight is treated individually, and vertical and horizontal curves are automatically subdivided at runtime to provide an accurate representation of the conveyor. 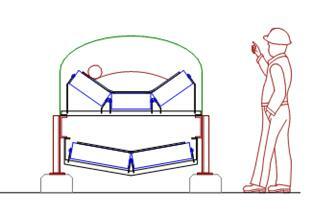 equipment to be positioned anywhere along either the carry or return sides. The ability to easily view the conveyor as components and final layout removes the guess work, and potential input errors, when analyzing a conveyor. 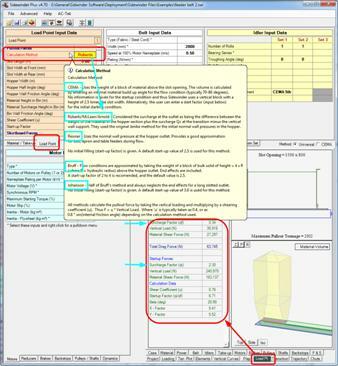 These layouts are also automatically included in the output design reports. The core Sidewinder philosophy has been to treat the conveyor as a “system” of design conditions, rather than as a simple design case. This design philosophy ensures that many conditions which may have otherwise gone unchecked are accounted for in the design phase. For example, belt liftoff is automatically calculated using a “worn” belt mass and the maximum corresponding belt tensions (belt inclines loaded, and high frictional conditions). This is extremely valuable to both new and experienced engineers as it often highlights problems area which may have otherwise gone unnoticed. 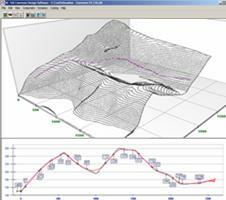 A Sidewinder conveyor design therefore results in the most comprehensive conveyor design of any software on the market. Additionally, a single, simple input table allows all relevant design conditions to be entered. Byway conveying, reversible conveyors, multiple materials and belt speeds, and various loading profiles can all be quickly and easily entered. Users can choose to use either a standard CEMA idler set, or a custom idler set. Custom idler sets allow up to six independent custom idler rolls to be used. Additionally, each roll is customizable within each idler set. This allows center rolls to have unique properties (length, bearing type, shaft size, etc) from wing or other rolls. Each conveyor element can have a unique idler set (up to eight different idler sets can be entered). This allows impact idlers, transition idlers, and other idler sets to be entered and included in the output report. Pipe conveyor design and other advanced features are also included. 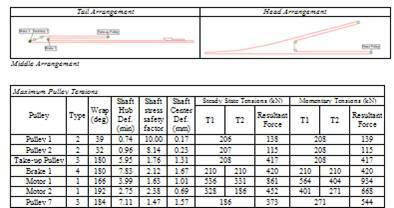 Detailed L10 life calculations, bearing and shaft deflections, and other data is calculated for each conveyor element, and then summarized in a single easy to read output table. Standard CEMA series sets, as well as SKF, FAG, and other manufacture bearings series are included. Furthermore, all idler and bearing input data is fully user customizable. 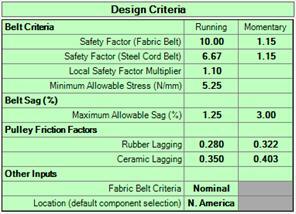 Up to five different material types may be entered for a single design. 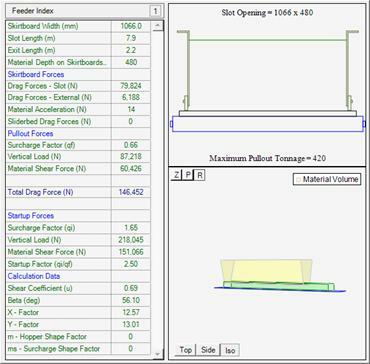 This is not only useful for analyzing worst case design conditions (for example using the lowest material density for maximum cross sectional loading), but also allows the conveyor to transport more than one material type. Additionally, the material type is specified at each load station, and therefore the conveyor can be loaded with different materials at the same time (different materials, and tonnages on the carry and return sides for example). The ridged dynamic input window of sidewinder allows a wide variety of options and the standard calculations automatically take into account both “operational” stopping conditions, and “emergency stopping conditions”. Starting of the conveyor may be done via a fixed starting time, or by using the maximum motor torque (squirrel cage motor) . 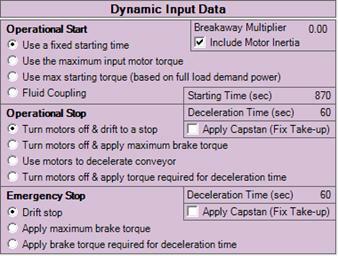 Breakaway motor torque is also calculated. 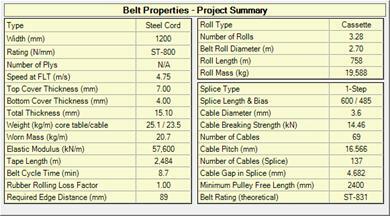 Sidewinder has combined a wide range of belting data from several of the leading belting manufacturers. This includes properties for both fabric and steel cord belting. Sidewinder’s “smart selection” capability will automatically estimate many of the most important belting parameters such as strength, weight, modulus, and type. Steel cord splice information, belt roll quantities, shipping and storage details, and other relevant belting information is automatically calculated. Pulley diameters, shaft stresses, bearing loads, allowable turndown ratios, and other important design information is automatically calculated for each pulley. An accurate graphical representation for each pulley is displayed showing belt tensions, wrap angles, and the pulley geometry. 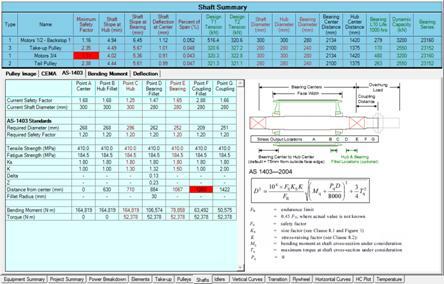 Shaft safety factors and deflections are highlighted in RED to show problem areas. 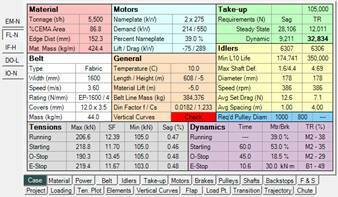 A pulley design page is also generated in the standard report output. Both CEMA and AS-1403 standards are included with all intermediate calculation values. Sidewinder includes an advanced workpage allowing overhung loads to be determined for various power conditons. These loads can then be used in the normal pulley and shaft calcaution equations. Sidewinder allows the user to enter all known masses and the center of gravity (CG) of each item. However, if these items are unknown Sidewinder can also estimate them using internal libraries created from published user catalog data. 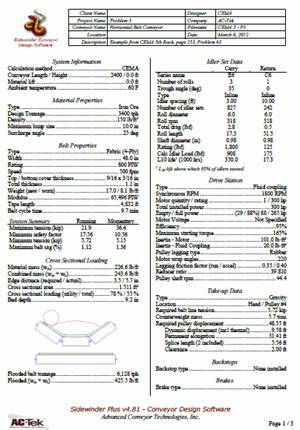 The New 6th edition CEMA manual contains the basic horizontal curve calculations for belt conveyors. 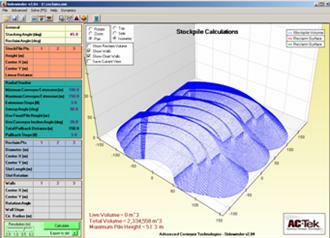 These equations and other published methodologies from various technical papers have been implemented into the Sidewinder Software. 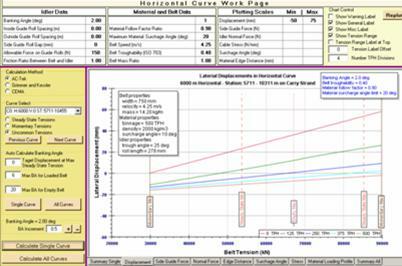 Easy to understand graphs showing belt displacements, edge stresses, side guide roll forces, and other critical information is given for each horizontal curve section. Additionally, combined vertical and horizontal curve effects are taken into consideration as well as idler forward tilt and other design options. Pipe conveyor use and applications are becoming more popular around the world. 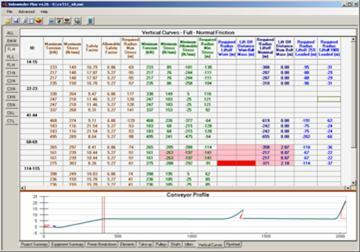 Sidewinder allows pipe conveyors to be analyzed and incorporates many specific equations for their proper design. 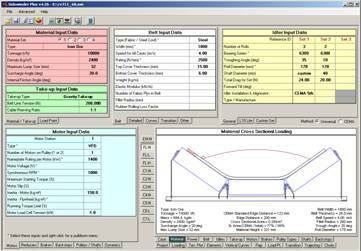 This includes inputs for power calculations, as well as calculating belt stresses in combined vertical and horizontal curve areas. 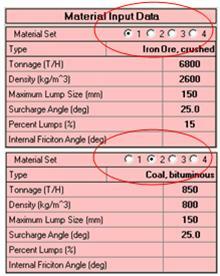 Recommendations are given for cross sectional loading as a function of material lump size and other factors. Walls and other boundary conditions. Select any case (fully loaded, inclines, declines) and quickly calculate power and other important design data as the conveyor is loaded and unloaded. The designer can then quickly see how long a given condition occurs. 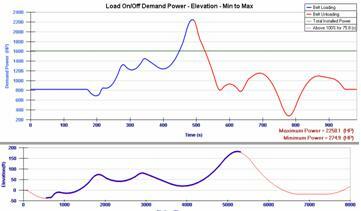 The image to the right shows the conveyor loaded from the lowest to highest elevation, and the corresponding power consumption, and time above motor nameplate rating. As Sidewinder has several calculation methodologies available it is very useful to quickly (and easily) view the individual breakdown of the various power components. 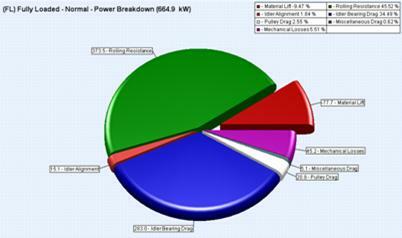 Sidewinder provides a pie chart for each load case showing this information. This is just one example of the many standard features available in Sidewinder making it the easiest to use, and understand conveyor design software package on the market today. 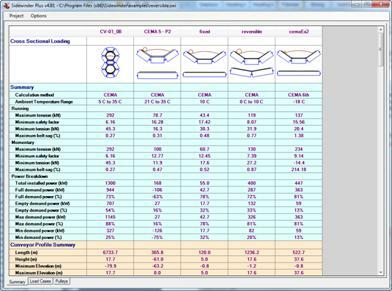 Both convex and conveyor curve radii are incorporated in the software. 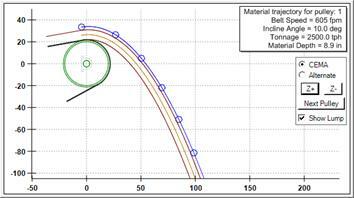 Belt lift off, center and edge stresses, belt buckling, and lift off distances are calculated for each concave curve and every load case. Likewise, belt stresses in convex curves and required idler spacing is also calculated. 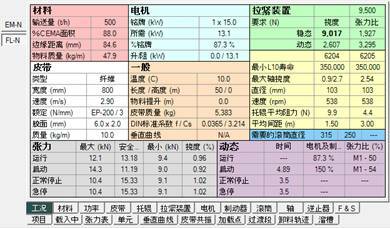 All cases are them summarized in an easy to read data table. Users can quickly spot, and correct problem areas. Sidewinder included feeder belt and pullout force calculations from a range of international standards and published papers. These include CEMA, Roberts, Bruff, and the Reisner methods. Up to ten different loading points can be entered. Loading points may be on either the carry or return side of the conveyor, and in either the forward or reverse direction (for reversible conveyors). 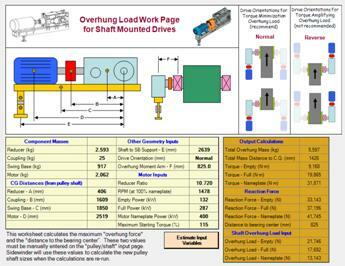 Plugged chute, and belt feeder calculations can also be included in the tension calculations to determine worst case motor power requirements. All calculated data is conveniently output to provide the engineer with a full understanding of how the tensions are calculated. Every conveyor has a transition area at the head and tail end when the troughed belt transitions to a flat configuration before traveling around the pulley. As belt tensions are often highest at the head pulley, belt edged stresses in these areas are also the highest in the belt. 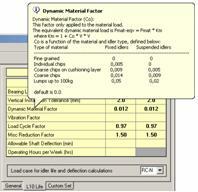 However, many conveyor design calculation programs ignore these areas. Sidewinder not only calculates the required transition lengths, but also outputs the required troughing idler angles, and packing heights for each transition idler set. 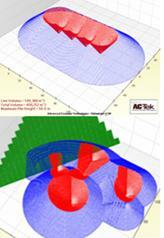 AC-Tek engineers are leaders in developing new conveyor design standards and equations. The calculations for belt turnovers is no different, and have been published by one of AC-Tek’s owners, Mr. Lemmon (turnover paper). 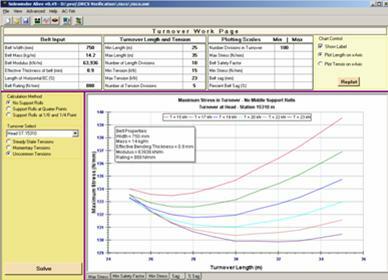 These equations are incorporated into the software along with a very easy to use information window which allows the engineer to determine the optimal turnover length and other design parameters. Careful attention must be paid to the maximum material buildup at the transfer point. 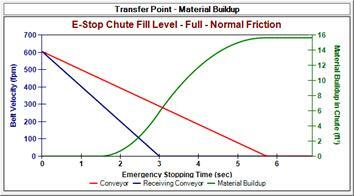 Many times a long (high inertia) conveyor will feed a short starting conveyor. In this case the long conveyor may take significantly longer to stop than the conveyor it is feeding. Sidewinder will automatically analyze all loading conditions and frictional cases to determine the maximum material buildup at the transfer point. This feature allows the 3D surfaces to be entered directly into the program. Both the horizontal and vertical profiles are coupled with this surface. The surface data can be imported from CAD, GPS meshes, or other data. 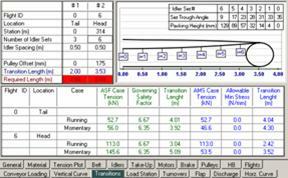 Cut and fill calculations can be preformed and alternate conveyor routes can quickly and easily be analyzed. 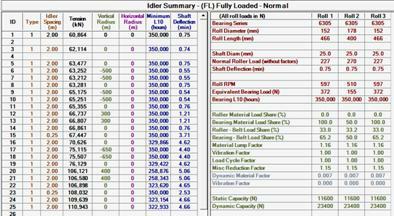 Load Case – One row is added for each load case of every sidewinder file. 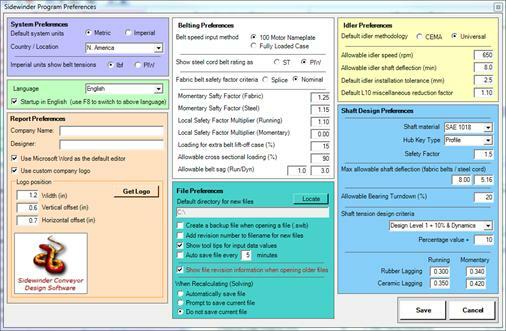 This is useful when looking at the detailed engineering and design of several files. Pulleys – A summary of every pulley in each file. “Multiple Conveyor Summary sheets” are very useful when you have a single conveyor but perhaps several design revisions. You can open various designs (for the same conveyor) and directly compare different designs to one another. You can also save/open your “list” of summary files for future access. You can print any of the summary sheets by using the “print” button. Or right click and “copy to clipboard” to export to Microsoft Excel or some other format. Sidewinder allows many inputs and design criteria to be individually tailored for a specific user, project, or company. This is very useful as these preferences can be shared between users allowing all engineers in the same company to design conveyor systems using the same design criteria. The user can also specify their own company logo which will then appear on all reports and word printouts. Over 25 short video tutorials (5+ hours) are available for the new, and experienced conveyor design engineer. Each tutorial focuses on a specific topic such as “vertical curves”, “feeder belts”, “reversible conveyors”, and other areas of interest. Tool tips are available for all user data inputs. 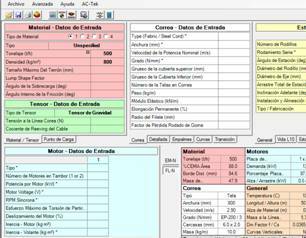 Each tool tip contains a descriptive meaning of its purpose, default values, useful equations, and other valuable information. AC-Tek also has full tech support for Sidewinder users who purchase an annual maintenance contract. So what are you waiting for……. Give Sidewinder a try today! If you are in need of a conveyor design package, or are tired of struggling with your existing software, give Sidewinder a try. We offer several pricing options to meet your design needs. Additionally, you can trade in your exiting or outdated conveyor design software for a substantial cost savings on a new Sidewinder license. Please contact us for more information.